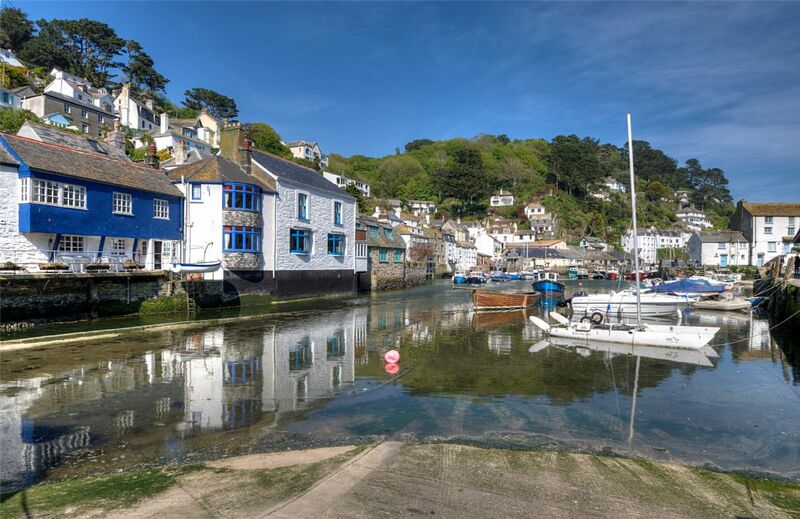 Picturesque Polperro Harbour shown as the tide goes out. 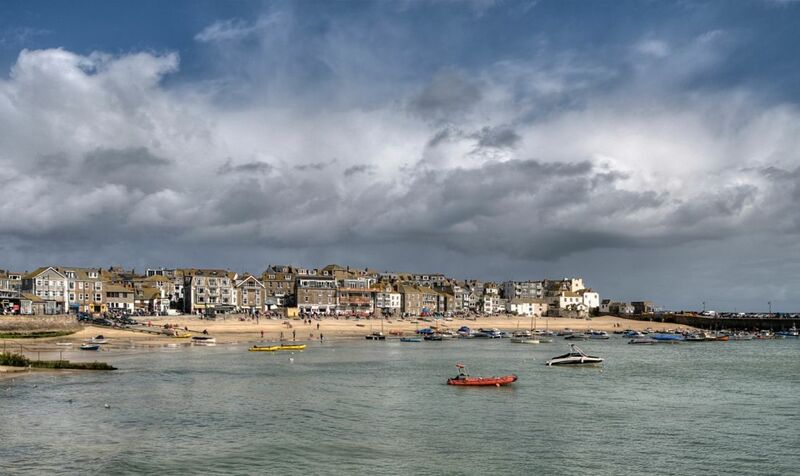 This is where the River Pol runs into the harbour. it is a popular village due the narrow roads and pretty houses. A quiet early morning in this photo. 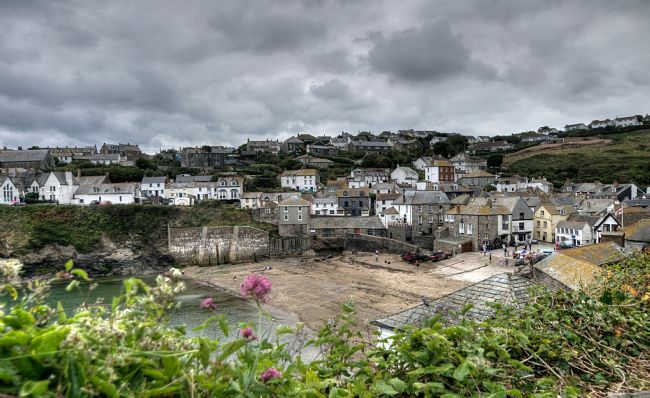 A grey moody day of Port Isaac viewed from the Coast Path. This beautiful fishing village in Cornwall was called Portwenn in the Doc Martin series. This collage of views of Cornwall includes Mevagissey, Polperro, Hayle, Fowey, Towanroath Engine House, St Ives, Looe, St Nectans Glen waterfall, Lantic Bay, Newquay and Cadgwith Cove on the Lizard Peninsula. If you do not know which view to choose from around Cornwall this might be a good and very beautiful solution. Looe beach and the River Looe in South East Cornwall. 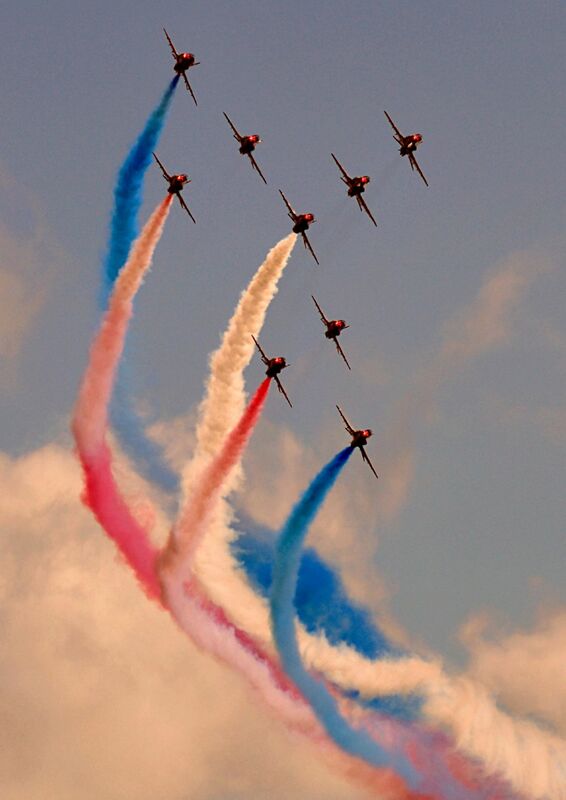 This view was photographed on the day of the Looe gig regatta. Gigs assembling on the beach ready for racing. Nine beautiful views of Torbay on one collage. Torbay or The English Riviera is made up of Torquay, Paignton and Brixham with a wide variety of views to enjoy. The wildlife in this view includes a seal, turnstone and cormorant. The views are of Babbacombe Bay, The Big Wheel in Torquay, beach huts at Broadsands, houses and lobster pots at Brixham and a heritage sailing boat also. Millendreath Beach and Bodigga Cliffs in Cornwall taken at sunrise. Sometimes known as Black Rock beach after the well known rock there and the cafe and resort. 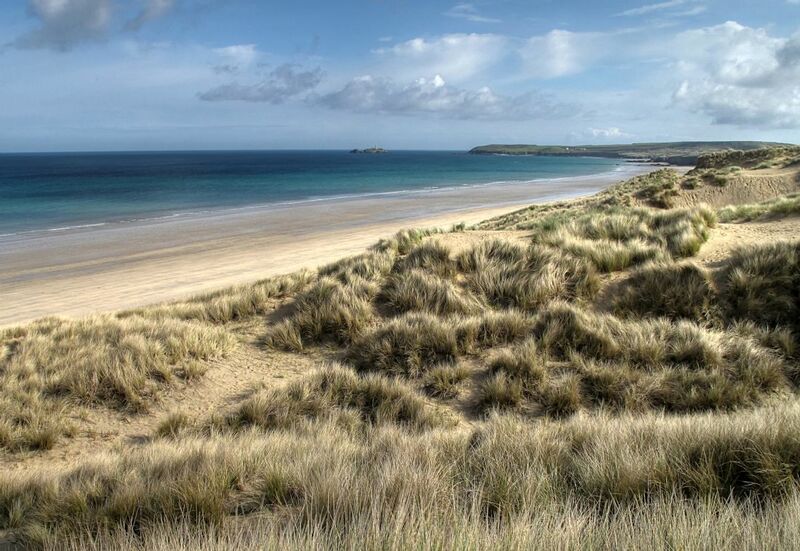 This view is taken from the walkway and this part of the beach is only accessible at low tide but very beautiful. Popular Mevagissey Harbour in Cornwall at high tide with all the colourful houses and boats reflected in the water. 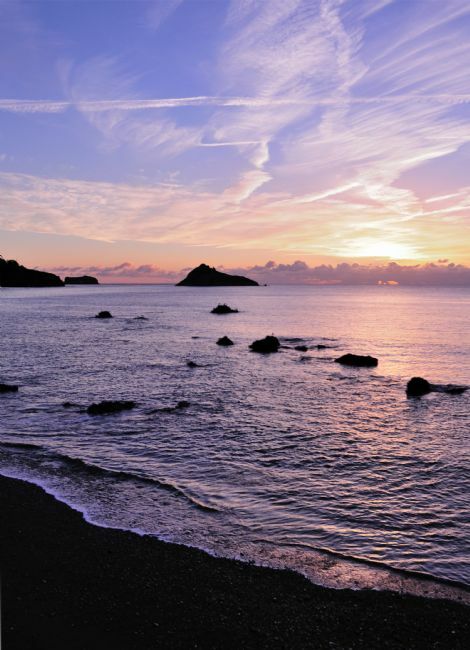 Beautiful delicate sunrise at Meadfoot Beach in Torquay South Devon. Looking towards Thatcher Rock and The Orestone. Beautiful thatched cottages in pretty Cockington village in Torquay Devon. This shows the Old Forge, Weavers Cottage and Cockington Gallery. 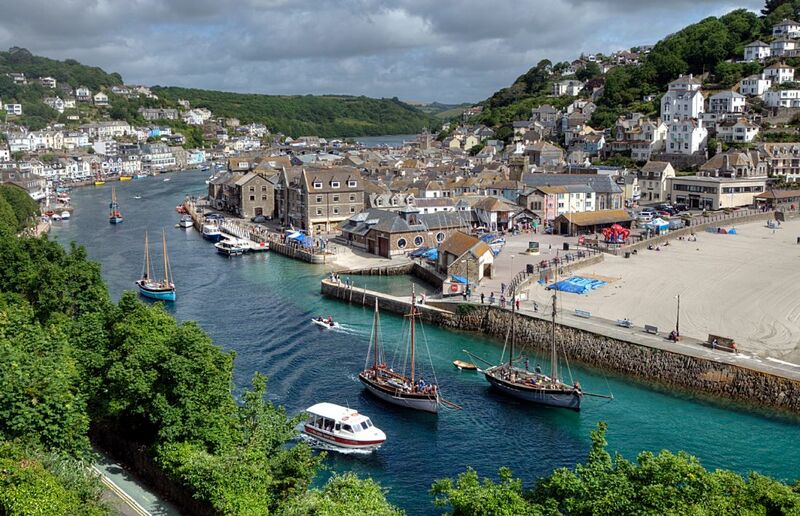 The little ferry boats travel to and fro across the River Looe between the West and East sides of the river. This saves a walk around across the bridge and is fun to do for just 50p a ride. Taken at the end of the day as the sun sets. 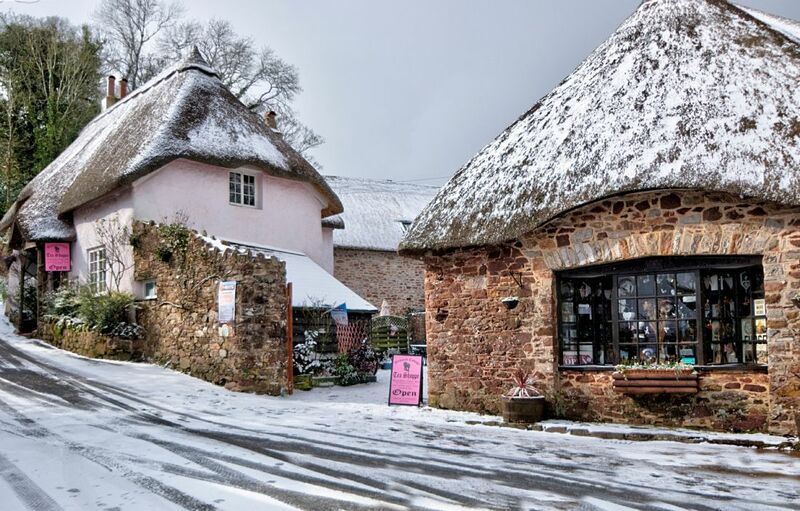 Snow is a fairly rare in Torquay but it happens occasionally and Cockington thatched cottages look especially pretty. 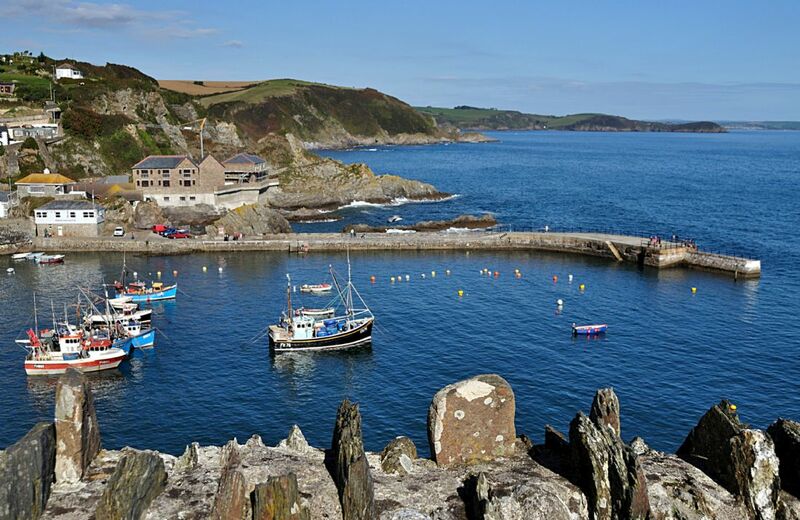 View from the coast path looking down on Polperro outer harbour and the net loft. 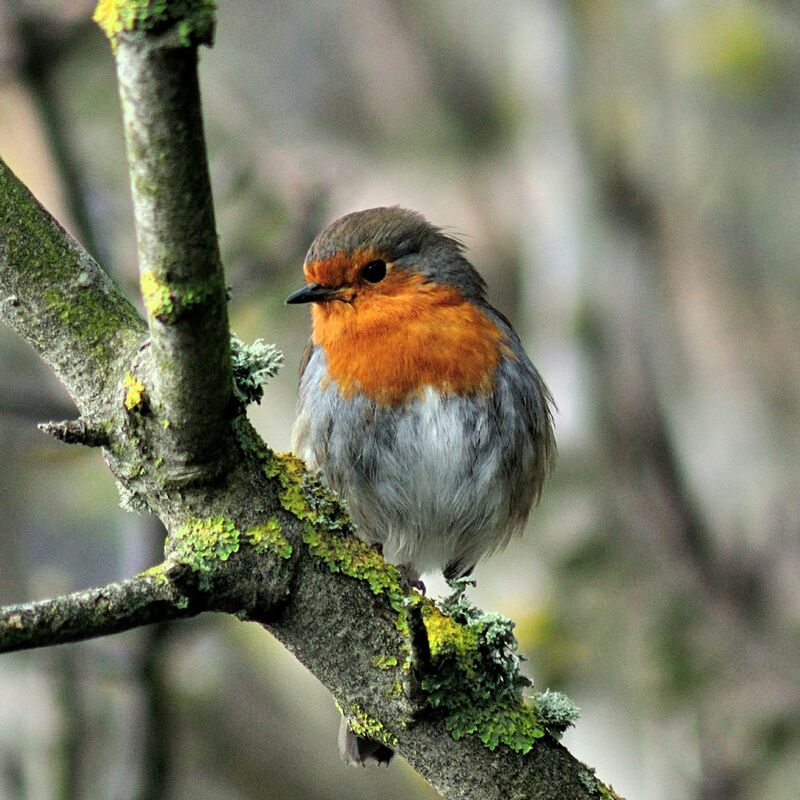 This photo has been given a digital artistic impression similar to an oil painting. 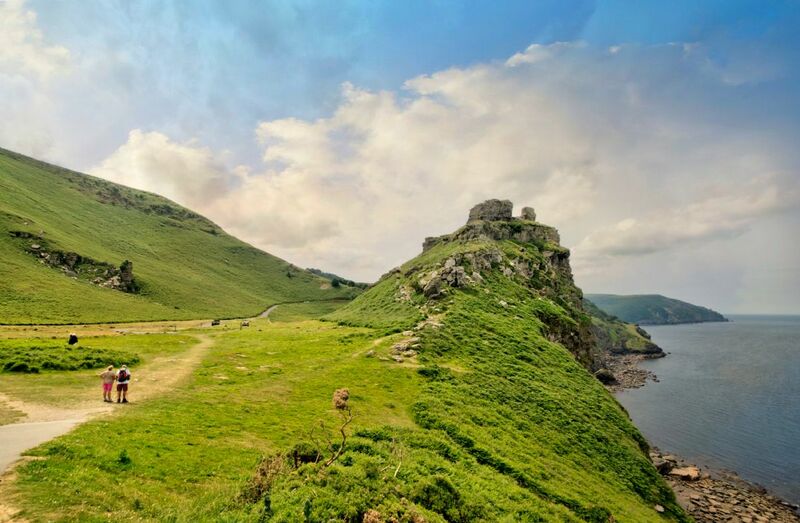 A portrait view of Valley of the Rocks in North Devon. 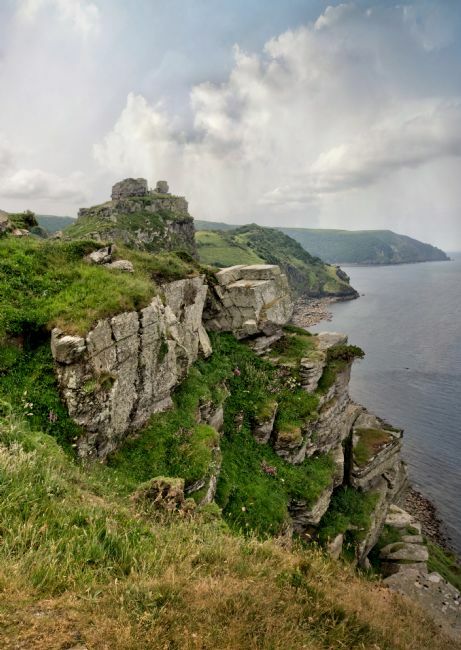 Captured from the coast path a short distance from Lynton. 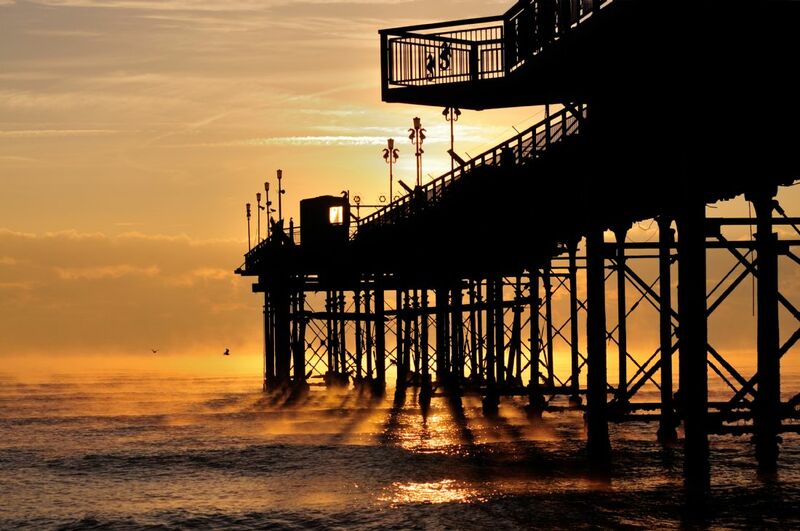 A misty cold morning at sunrise by Teignmouth Pier in South Devon. A beautiful silhouetted view of the pier against the orange sky. 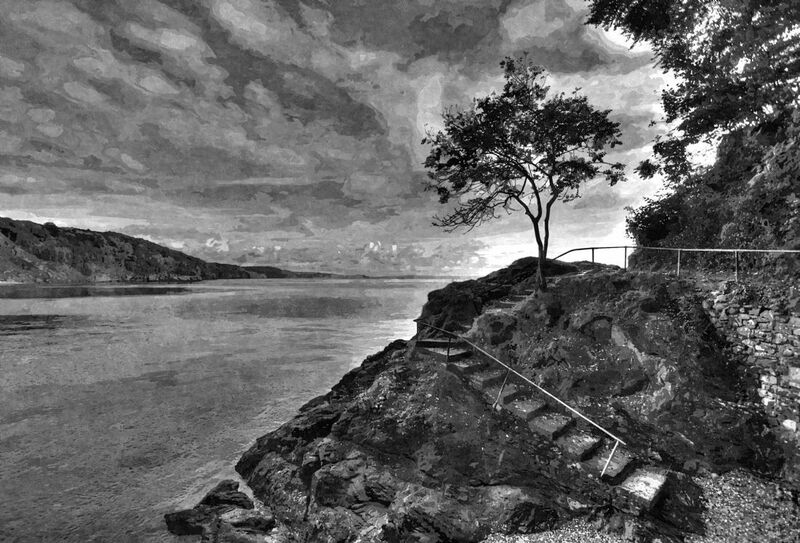 A lone tree at a small cove often called Half Tide Beach which is on the coast path between Babbacombe Beach and Oddicombe Beach in Torquay. Black and white with a digital painting effect in this photo. The Valley of the Rocks runs parallel to the coast in North Devon about 1km from Lynton. The scenery here is spectacular and goats graze amongst the rocks and on the cliff path. 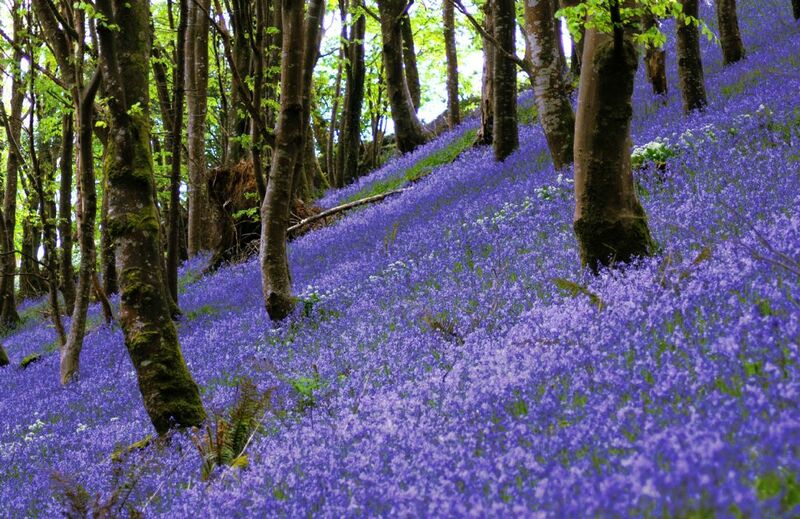 Bluebell Wood on a hill near Looe in Cornwall. A beautiful bluebell wood near Looe in South East Cornwall. 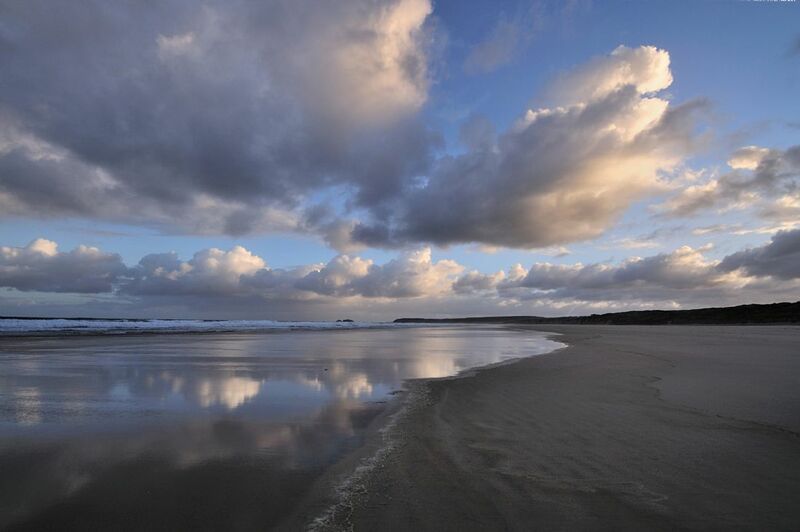 Early morning cloud reflections on Hayle Beach with Godrevy lighthouse on the distance. 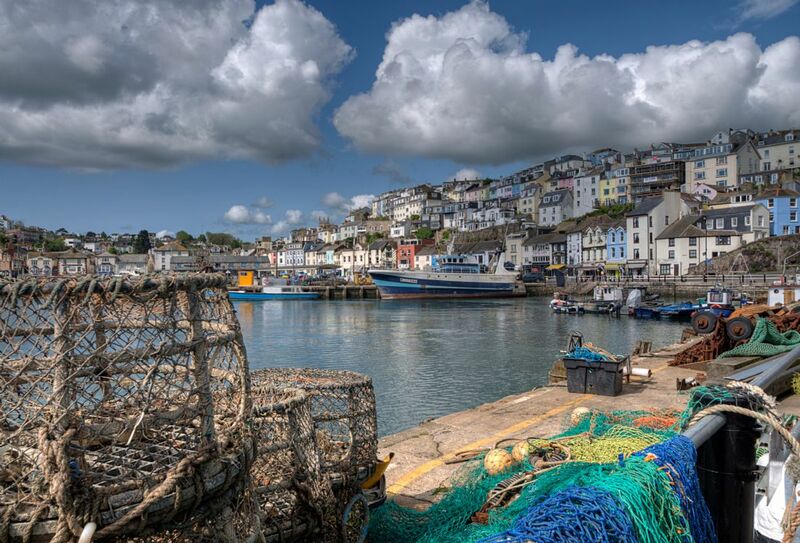 A beautiful view of Brixham Harbour taken on the slipway. The popular Golden Hind Museum ship can be seen in this view. 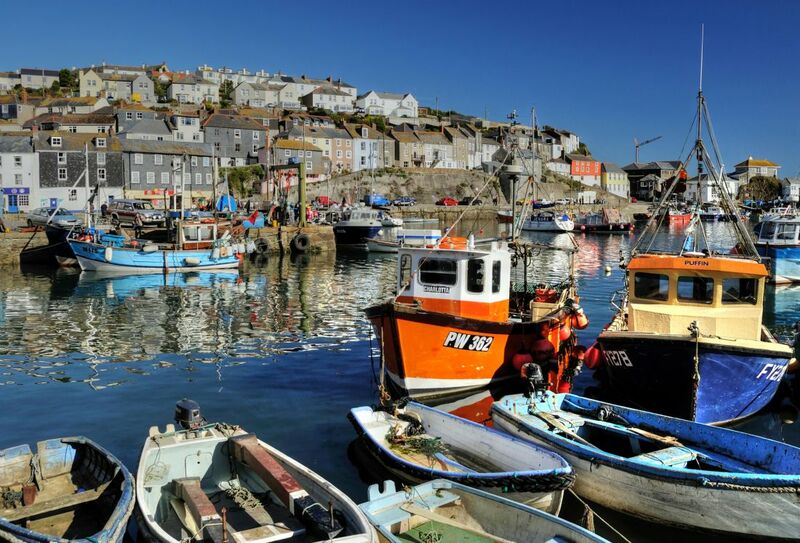 Brixham is part of the area known as The English Riviera due to the mild climate. 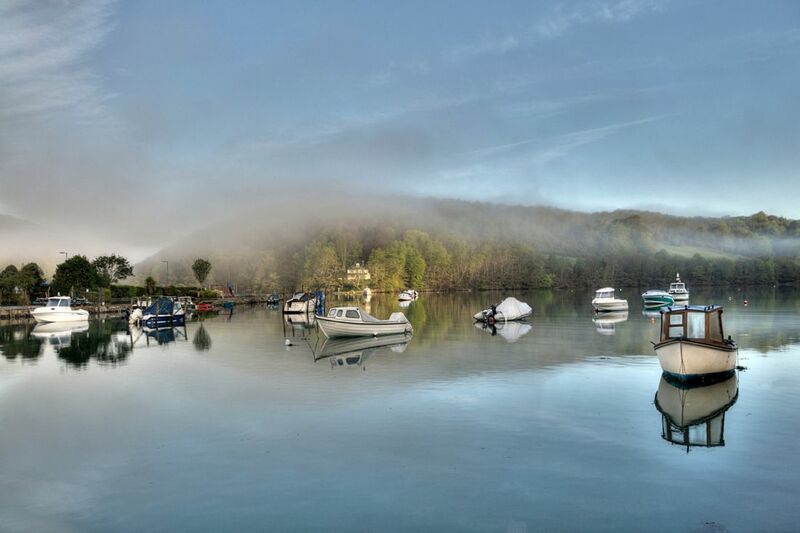 A beautiful morning at Looe as the mist rises on the river producing magical reflections on the water. Viewed from East Looe looking towards West Looe. Old wooden groynes at Porlock Weir in Somerset. 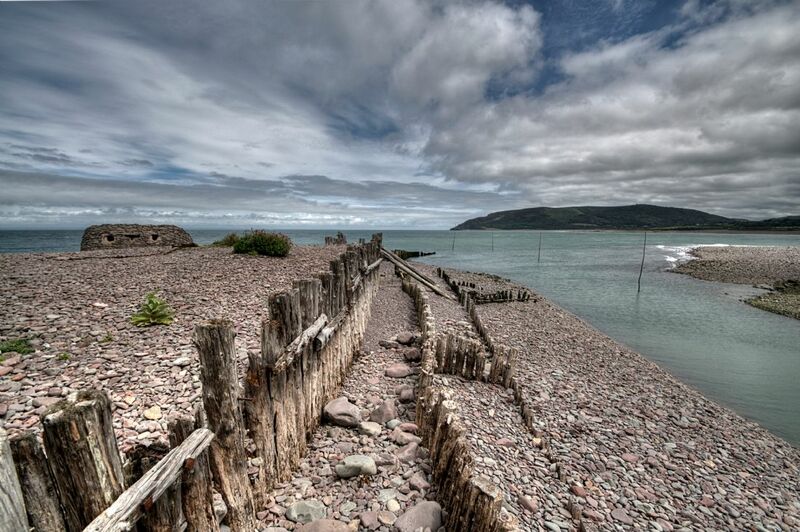 Dry old groynes and pebbles at the beach by Porlock Weir in Somerset. 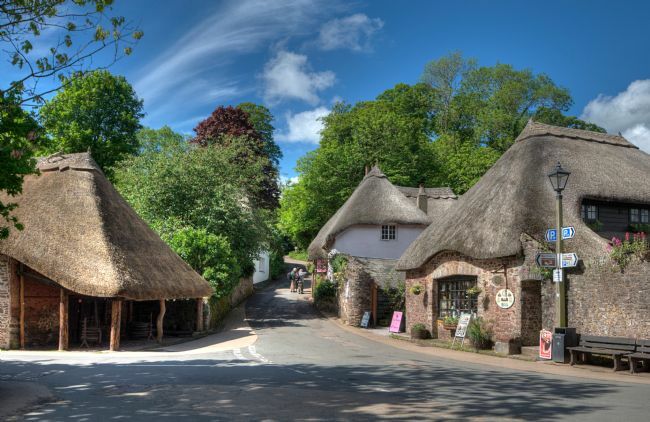 Porlock Weir is about 1.5 miles from the village of Porlock . Porlock Weir is a small group of picturesque houses around a harbour. St Nectan's Glen is an area of woodland in Thevethy near Tintagel in North Cornwall stretching for about a mile along the banks of the Trevillet River. 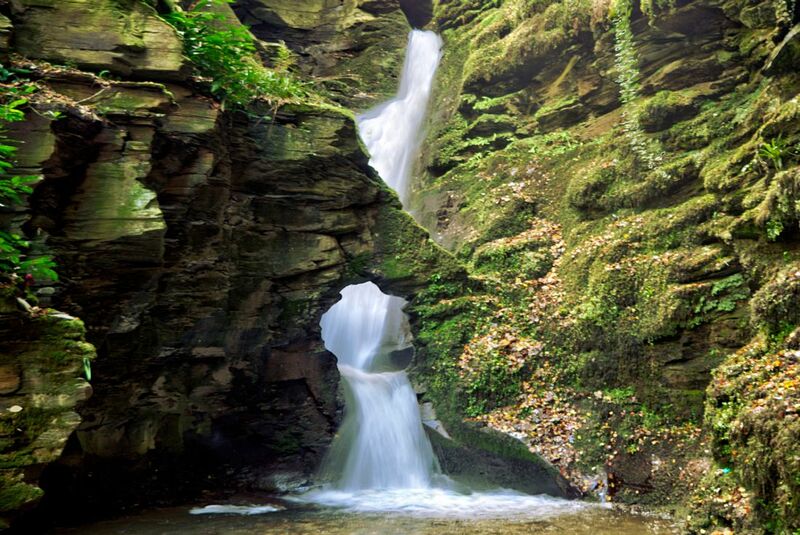 This beautiful waterfall running through the rocks can be seen at the far end. A peaceful morning on the Banjo Pier at sunrise. The beautiful fishing port of Looe is magical at all times of the day and night. 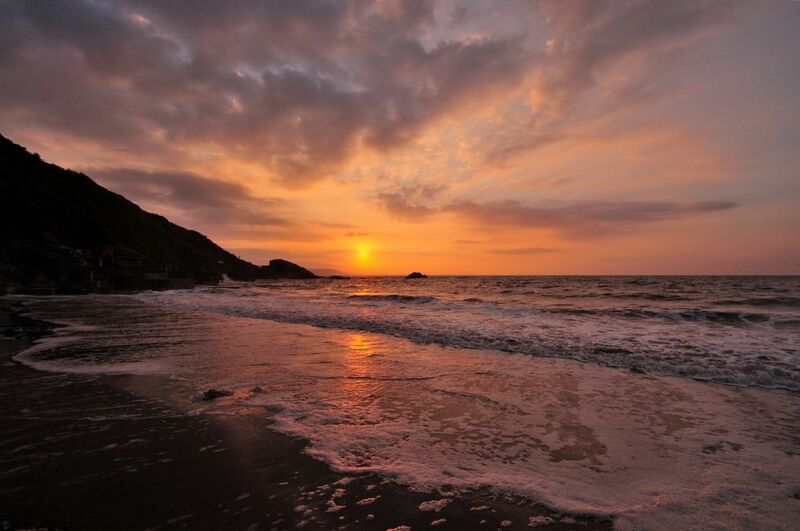 Beautiful colours at sunrise on Looe Beach at low tide. 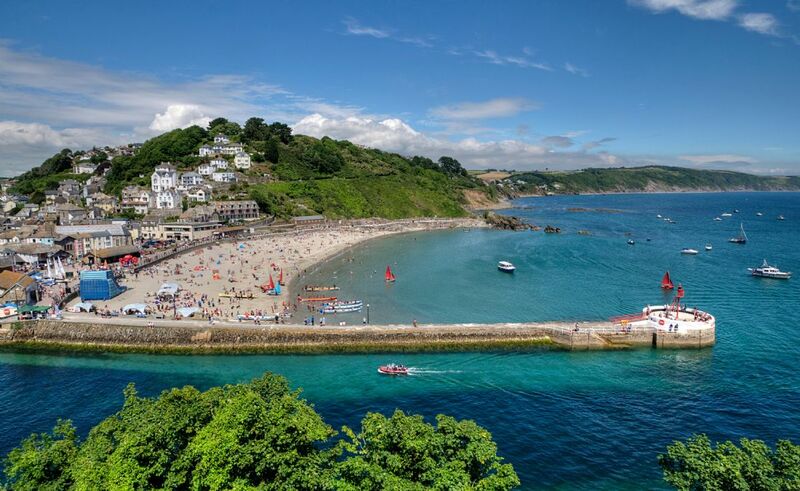 Looe town beach is in East Looe in South East Cornwall. 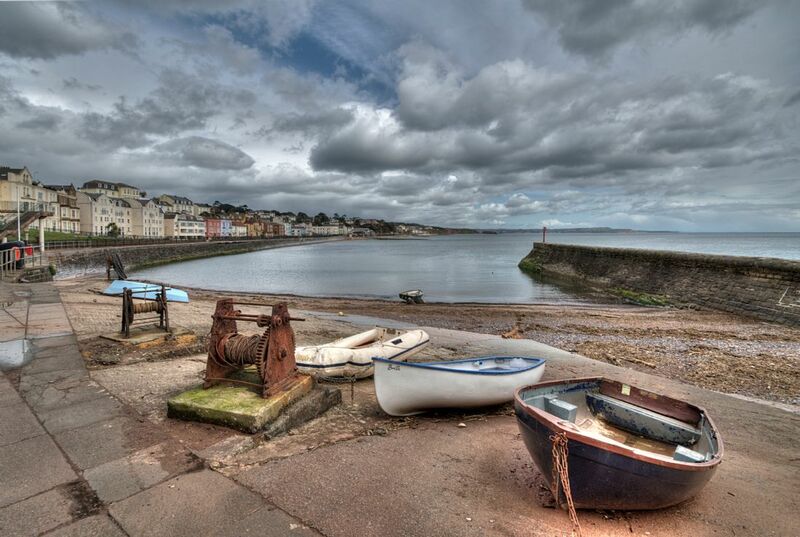 Boat Cove is a quiet little cove at the end of Dawlish Promenade where several boats are moored. The old boat winches give it a quaint appearance. The train line runs along the promenade and past this little cove. 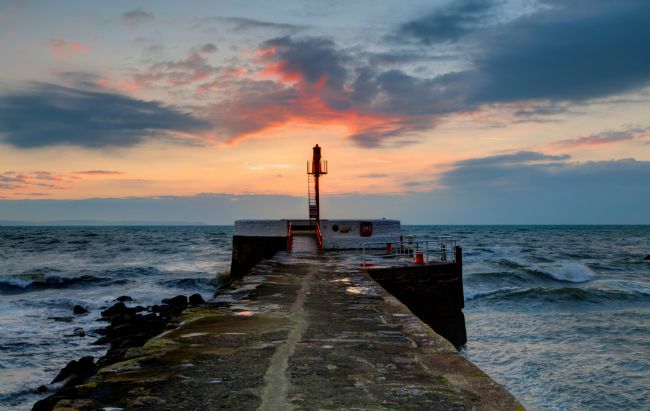 The Old Boat launch is a familiar feature on Teignmouth Back Beach. 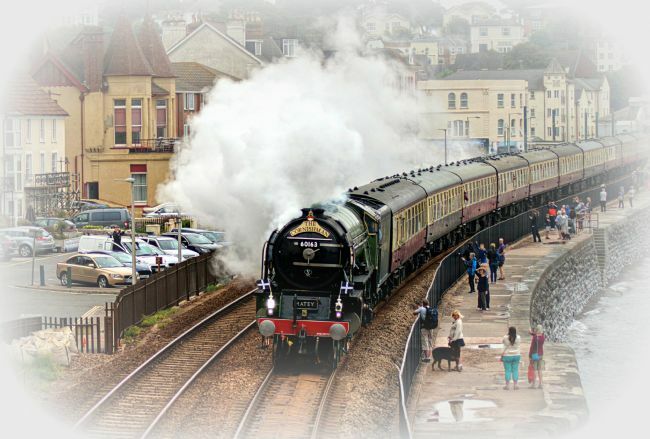 A visit to this beach on The River Teign Estuary gives you a feeling of going back in time. 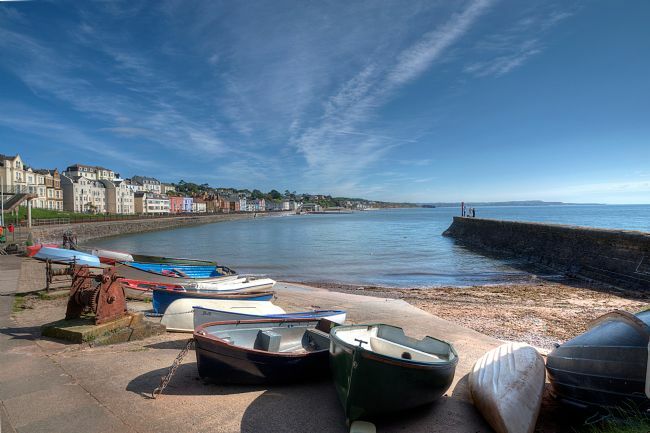 A popular place for all ages where the ferry goes to and fro to Shaldon on the other side of the estuary. 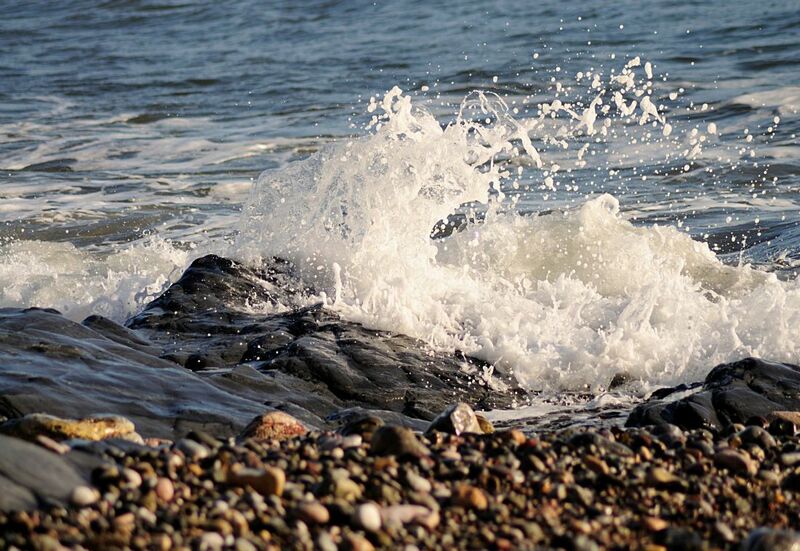 Waves come over the sea wall at Meadfoot Beach in Torquay. 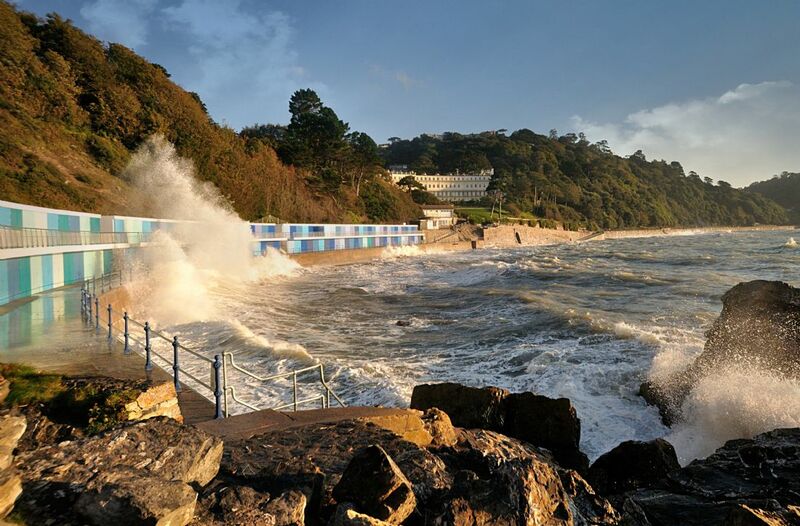 View taken from the end of the beach looking towards the beach chalets, the Osborne Hotel and Meadfoot Beach cafe. Torquay is part of the English Riviera known for its mild climate. Colourful reflections at Brixham Harbour in South Devon. The Golden HInd museum ship is a popular feature at the harbour and can be seen in this photo also. 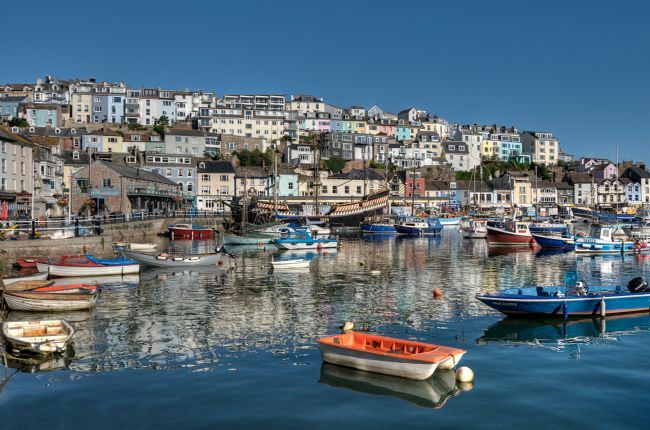 Brixham is part of the area of Torbay which includes Torquay Paignton and Brixham, also known as The English Riviera due to the mild climate. Beautiful pastel shades of blue as the sun goes down on the River Looe in South East Cornwall. 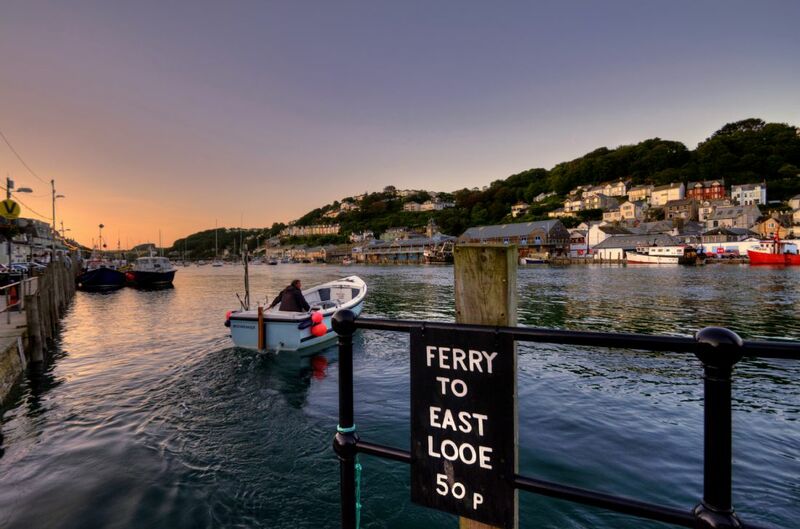 The little ferry boats moored up at West Looe. 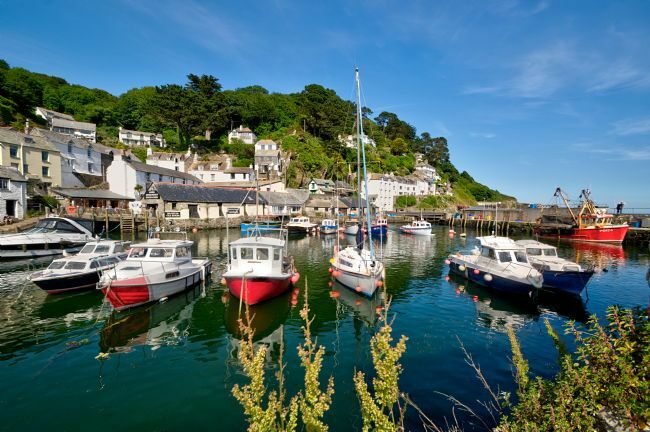 Beautiful Polperro in South East Cornwall. 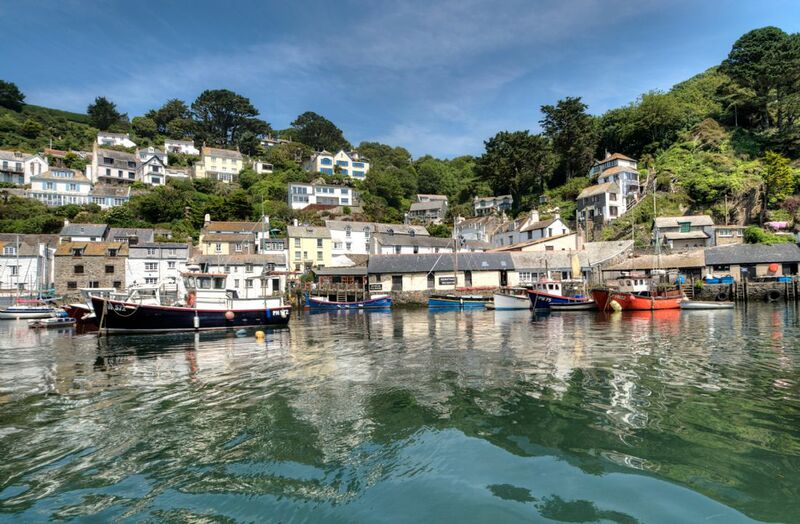 A sunny summer's day showing colourful reflections of the boats and houses. The Tornado steam train pulling the Cornishman in Dawlish, South Devon. 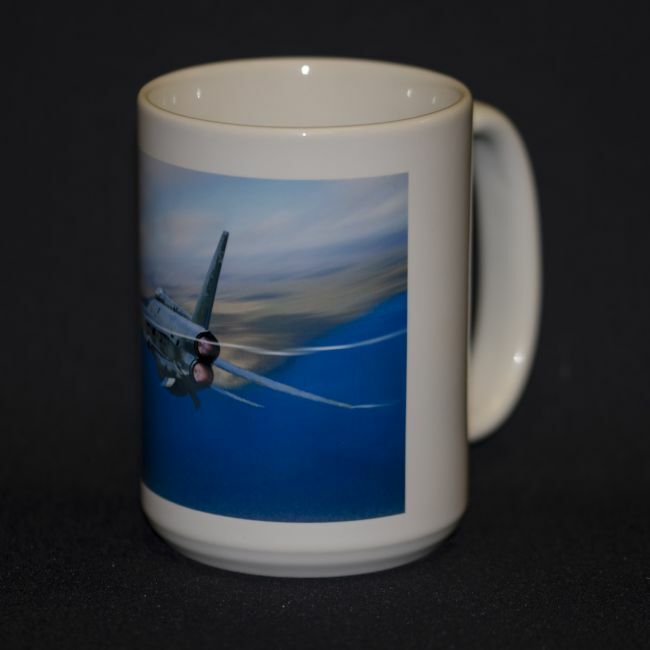 This photo was taken on a misty overcast day and has been given an interesting slightly sepia effect. 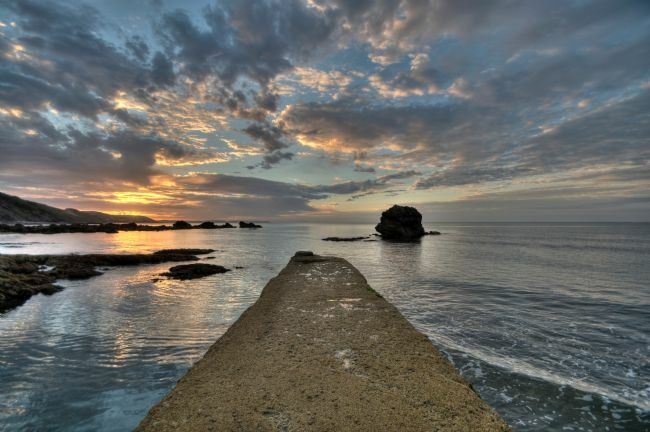 A beautiful photo of Boat Cove at the end of Dawlish Promenade in South Devon. Unusual old boats winches add an interesting aspect to this little cove. The train line runs along beside this promenade and past Boat Cove also. Four sparrows having a lovely bath together as the autumn leaves fall. 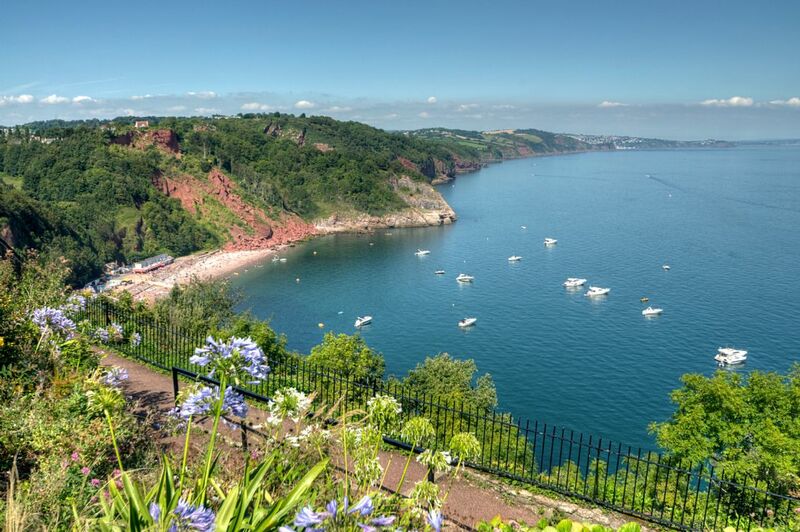 A view of Babbacombe Bay and Oddicombe Beach from the cliff top on Babbacombe Downs. Taken on a summers day with lots of boats out in the bay enjoying the sunshine. 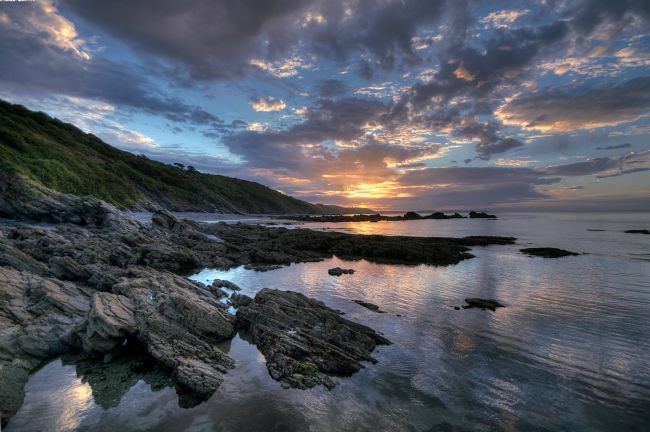 Sunrise at Millendreath in Looe South East Cornwall. The rock is called Black Rock and the beach is often known as this by some due the cafe and resort there. Beautiful Dawlish Brook and fountain which has been given a digital painting treatment from my original photo. View at sunrise taken from Hannafore in West Looe looking towards Looe island. The popular fishing port of Looe is situated either side of the River Looe and Looe island is just a short distance out to sea and occasionally can be walked to at very low tide. 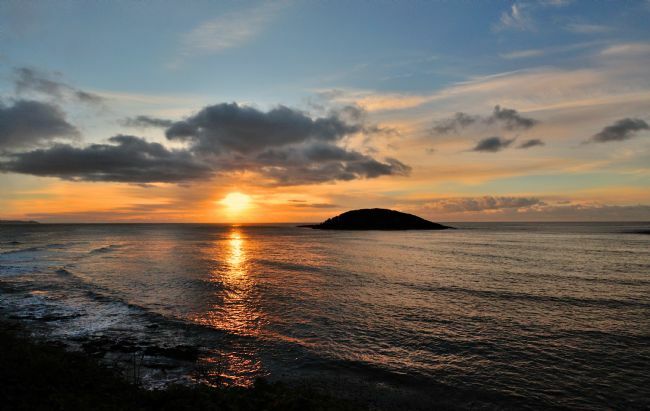 Looe island is also known as St Georges island. 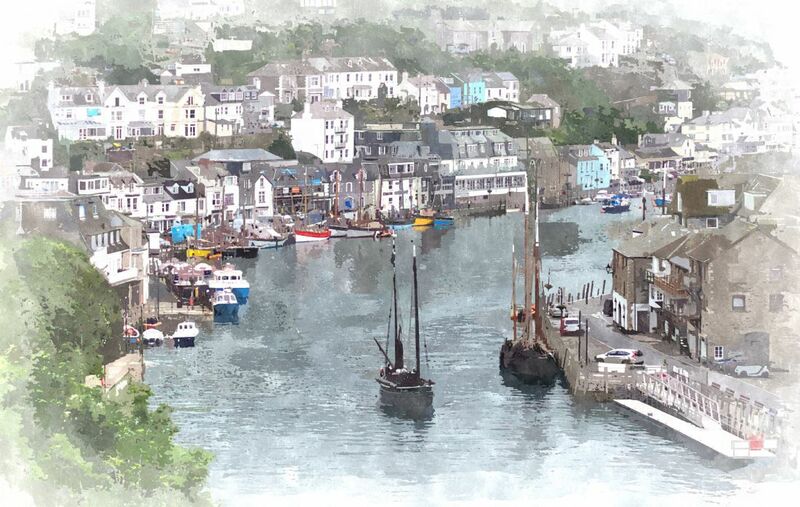 This is a digital painting effect from one of my original photo of Looe. The Looe Lugger Regatta is a two day event and takes place every two years and many luggers return to Looe to race in this fabulous event. 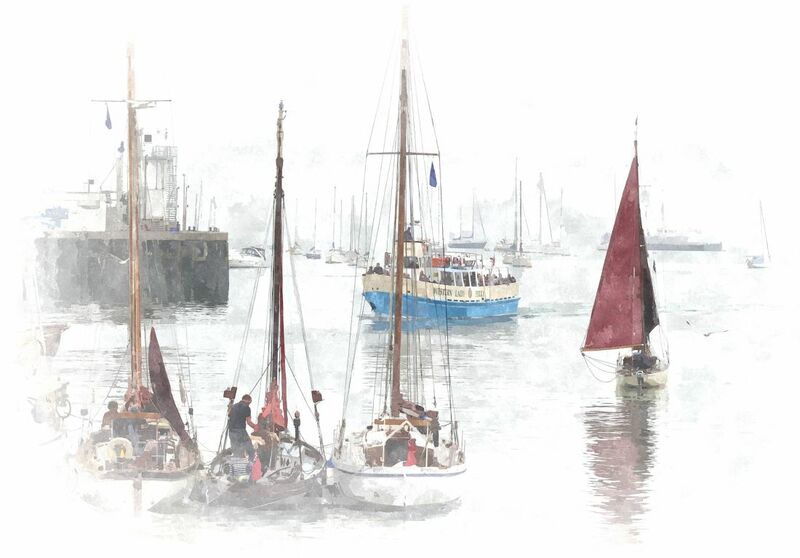 The views are fabulous as the luggers can be so clearly seen arriving and also heading down the river to race. At the end of the racing they return to moor for the night and it is lovely to wander around both West and East Looe to look at them. 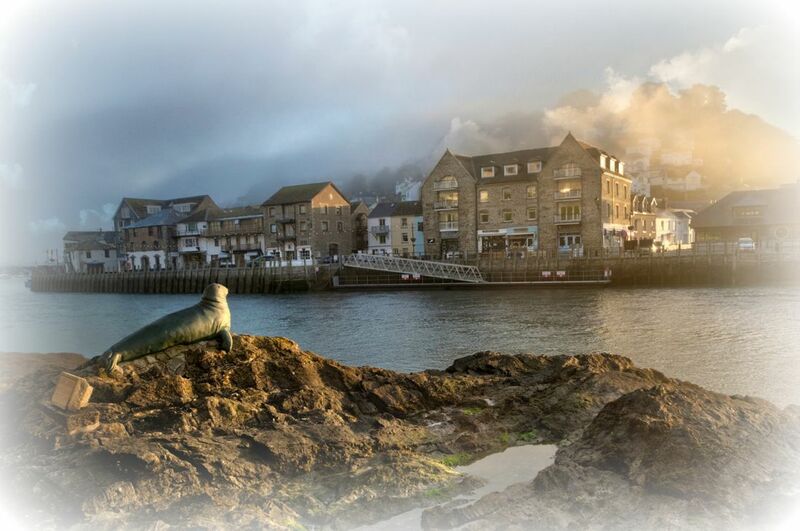 A lovely view of Looe on a misty morning just after sunrise. Nelson the one eyed Seal was a popular visitor to Looe Harbour for over 25 year. 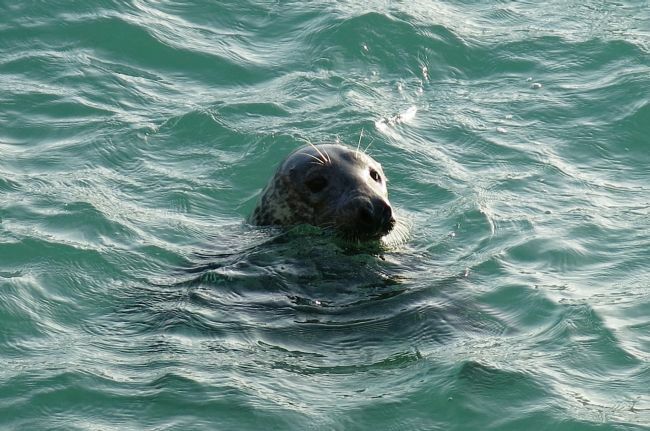 The seal took up residence on Looe island and would swim over to the harbour to entertain and be entertained by tourists and locals. After Nelson died in 2003 a bronze sculpture was commissioned and created by Cornish scultor Suzie Marsh. Beautiful Polperro Harbour in South East Cornwall. Colourful boats and houses are reflected in the water. 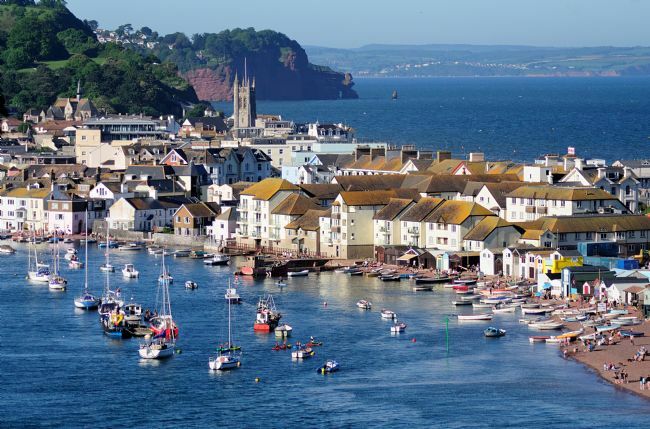 A beautiful view of Teignmouth Back Beach and town viewed from across The River Teign Estuary. 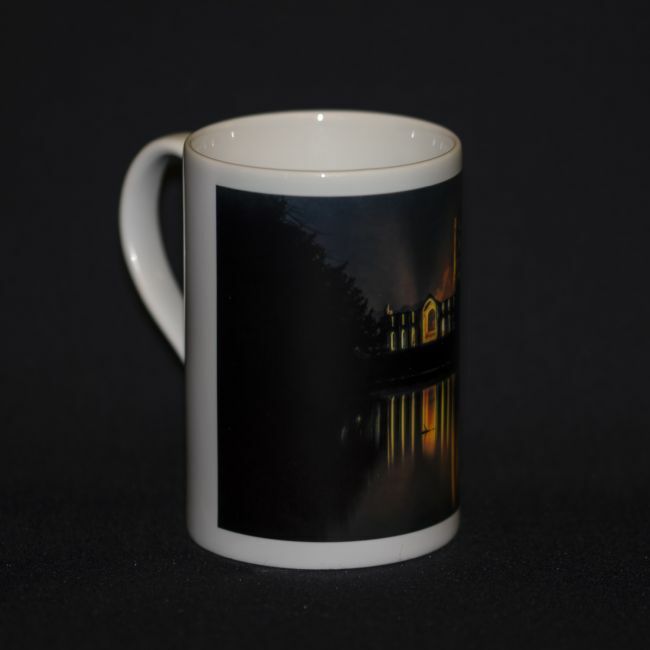 The photo was taken from The Botanical Gardens at Shaldon. Also in the photo the sandstone cliffs along the South West Coast Path showing the Parson and Clerk Rock formation. 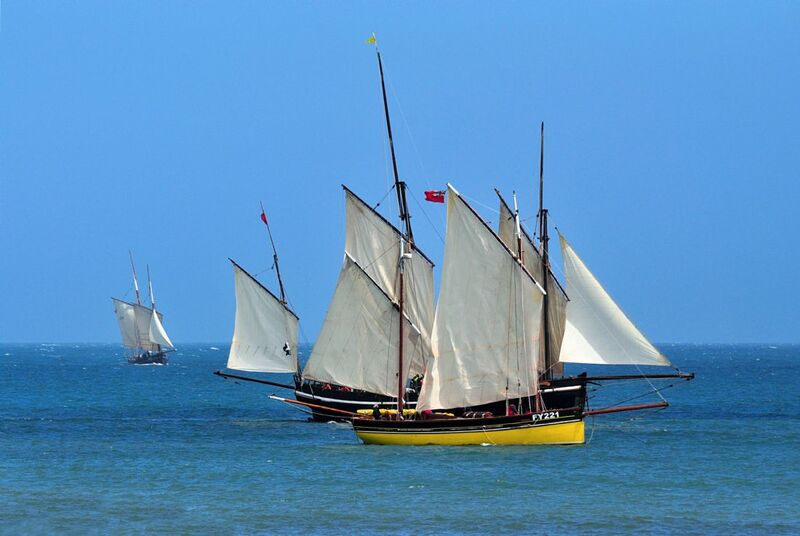 Looe luggers heading down the River Looe out to sea to commence the Looe Lugger Regatta. 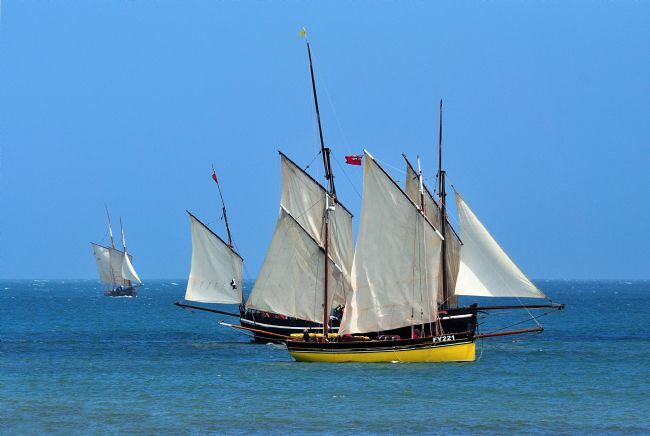 A two yearly event in Looe where traditional Looe luggers come back compete against each other. 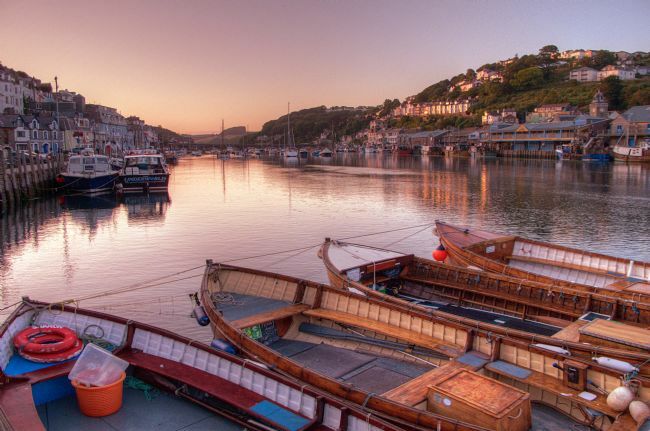 The beautiful port of Looe is a great backdrop for these magnificent boats. 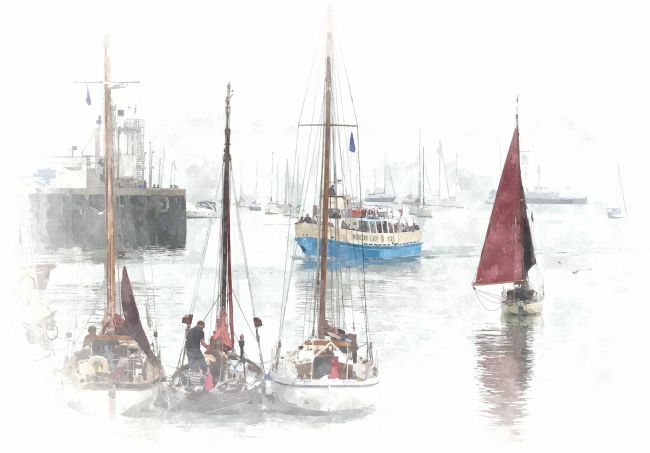 A digital painting effect from an original photo of Heritage Sailing Boats at Brixham taken on a misty hazy morning. 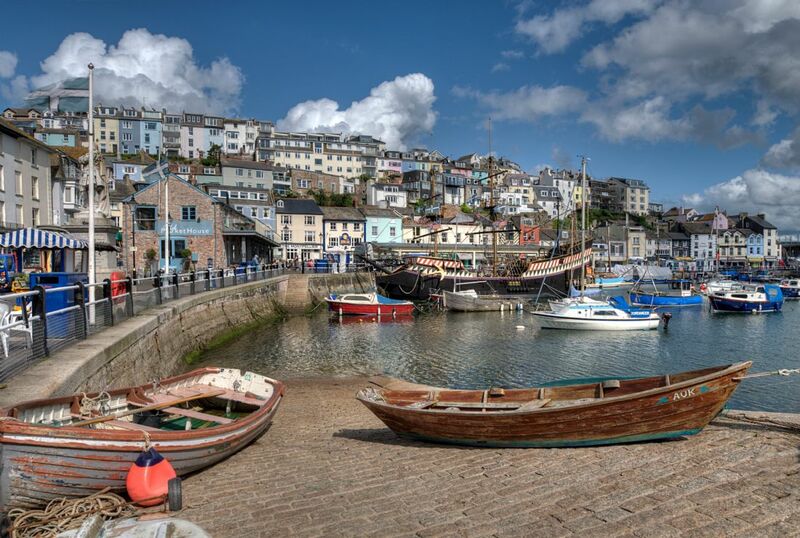 The Western Lady Ferry which travels between Brixham and Torquay also features in this photo. 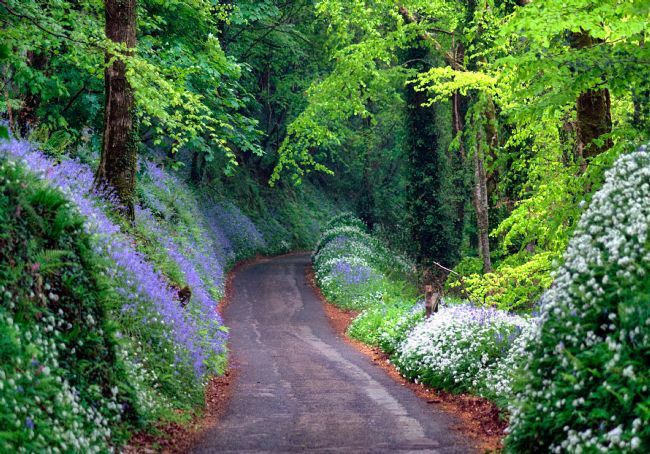 Beautiful bluebell woods on the way to Duloe in South East Cornwall. These woods are not far from the popular fishing port of Looe. Looking down on Looe Beach and The Banjo Pier from Hannafore in West Looe. 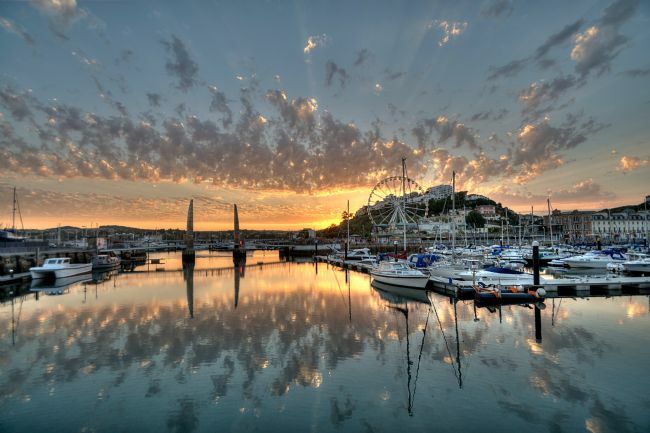 Colourful orange sky and clouds at Torquay Harbour with the Big Wheel.